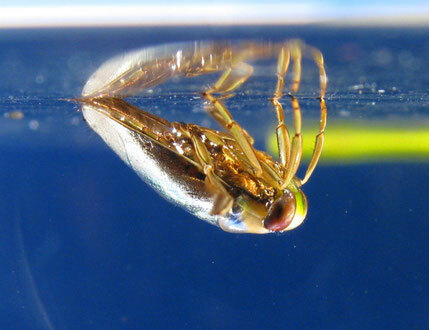 Attachment devices in stream insects - petraditsches Webseite! One of my main interests is to understand the adaptations of animals to challenging habitats such as living in strong currents. While some benthic (bottom living) stream animals avoid the current to some degree others reach out into current exposed places. The later ones have a number of morphological adaptations to withstand the forces of rapidly flowing water. Among those morphological adaptations are attachment devices, which help benthic animals to keep their position. We have made some progress in understanding the interplay of attachment devices with the surface structure of aquatic substrates. For example, some stream mayfly larvae have obvious tarsal claws, and also microscopically hairy attachment pads on the underside of the gill lamellae (Ditsche-Kuru et al., 2009, 2010) (Figure 1). Attachment pads have evolved more than once in mayfly genera on different continents (Ditsche-Kuru et al. 2011). Figure 1. A) Mayfly larva E. assimilis in the current holding to an artificial substrate in a flume. The major substrates of these stream mayfly species are stones and rocks, which vary considerably in surface roughness (Ditsche-Kuru, 2009). Different attachment devices have distinct advantages for surfaces of a particular roughness. For example, larval claws require a minimum surface roughness, but the hairy attachment pads work on smooth surfaces, which enlarges the range of substrates the larvae can attach to (Ditsche-Kuru et al. 2010, 2012). Which impact has the biofilm on attachment? environment, organic material, bacteria, and fungi form a primary biofilm on the surface of the substrate. In comparison with the primary substrate, these biofilms are usually softer and change the surface structure as well as the surface chemistry. Roughness, material stiffness, wettability, surface chemistry and temperature can potentially have effects on adhesive strength. Our investigations indicate that the biofilm strongly influences the ability of some aquatic insect larvae to attach to the substrate surface.We performed attachment experiments with live E. assimilis larvae in a flow channel using different substrates with defined surface rough­ness. Additionally, we measured attachment forces generated by dissected claws on the same substrates and mechanical properties of the biofilm. The experiments were performed on all substrates with and without biofilm. Our results show that on substrates with smooth or slightly rough surfaces, where the claws hardly find surface irregularities to grasp on, the presence of the biofilm increases the friction force of claws significantly. Consequently, the larvae can endure higher flow velocities on these smooth substrates. The opposite effect takes place on rough substrates, where the attachment force of claws decreases in the presence of biofilm. Consequently, biofilm is an important impact factor on the ability on the larvae to attach to the substrates in various stream habitats. Drag forces act on animals, which are staying in place in currents as well as on those animals, which moving through a fluid. Drag comprehends different components, and skin friction is one of them. With an interdisciplinary team of engineers, physicists, biologists and industry partners we investigated the air retaining properties of superhydrophobic surfaces in aquatic insects and water plants. Our results revealed remarkable air retaining abilities e.g. for the backswimmer Notonecta glauca, which can retain an air film over a long time period and at high flow velocities (Ditsche-Kuru et al., 2011). These surfaces are an interesting model for biomimetic solutions for industry as they have the ability to reduce surface drag considerably and thus reduce propulsive power.